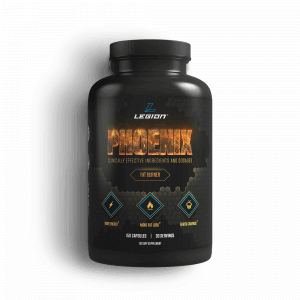 If you want to know how Legion Phoenix compares to Evlution Nutrition LeanMode in terms of ingredients, dosages, and effectiveness, then you want to read this article. 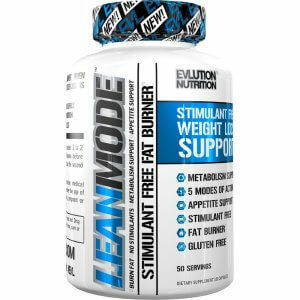 LeanMode contains one ingredient that has been proven to accelerate fat loss, but unfortunately the dosage is too low to be effective. In addition to that, LeanMode contains four ingredients that either barely or don’t work. If you don’t put much faith in the scientific literature or feel particularly drawn to LeanMode for whatever reason, then it may be the better choice for you. LeanMode is the number-one-selling fat burner on Bodybuilding.com, boasting an impressive average rating of 9/10 based on feedback from over 2,000 customers. It doesn’t contain stimulants or proprietary blends and features several popular ingredients generally associated with weight loss like Garcinia cambogia, conjugated linoleic acid, and green coffee bean extract. My fat burner supplement Phoenix, on the other hand, has a very different formulation designed to to increase metabolic rate, amplify the power of your body’s fat-burning chemicals, and reduce hunger and cravings, and it has over 1,000 positive reviews on Amazon.com and the Legion Store. LeanMode is relatively inexpensive, doesn’t contain any harsh stimulants, and features five well-known ingredients purported to accelerate fat loss. Unfortunately, though, none are included at clinically effective levels, and studies show that several of them probably or definitely don’t work. What Does Science Have to Say About LeanMode? Both Phoenix and LeanMode claim to have scientifically validated formulations, so let’s see how they compare in this regard. Conjugated linoleic acid (CLA) is a type of unsaturated fatty acid found in meats, poultry, dairy, and eggs (grass-fed varieties contain the most). Research shows that CLA can activate certain physiological processes associated with fat burning, indicating that it should help speed up fat loss. The problem, however, is that while CLA appears to work well in mice, studies show it’s very unreliable in humans. It works as often as it doesn’t, and in some cases, it’s even resulted in fat gain. Furthermore, even when people do respond well to CLA, its effects are minimal. For example, in one study conducted by scientists at the University of Wisconsin-Madison, people who took CLA for seven months gained about 2.3% less body fat than people who took a placebo, amounting to about a quarter of a pound less total fat gain. Not only is that a rather meaningless effect, it wasn’t even increased fat loss—it was just a reduction in fat gain. As far as dosing goes, if we only look at the studies in which CLA worked, then the clinically effective dosage is 3.4 grams per day, with larger amounts not being more effective. Therefore, the 500 mg of CLA in a serving of LeanMode is well below the amount needed to maybe sometimes in some people produce a very slight increase in weight loss. It serves several vital functions in the body, mostly related to the production of cellular energy. Thus, it’s not surprising that most of the L-carnitine in your body is found in your muscles, which have to be able to quickly generate a tremendous amount of energy. Acetyl-L-carnitine (ALCAR) is a form of L-carnitine that has gone through a chemical process known as “acetylation,” which allows it to pass the blood-brain barrier. ALCAR is often taken as a nootropic, as it’s been shown to reduce mental fatigue and improve cognition in the elderly. While studies show that supplementing with certain forms of L-carnitine can reduce muscle damage and improve recovery, it’s also often touted as a fat loss aid because it’s involved in the physiological processes that result in fat burning. Unfortunately, however, research shows that increasing your body’s L-carnitine stores to above-normal levels through supplementation doesn’t increase fat burning. In other words, supplementing with L-carnitine isn’t going to help you lose fat faster unless you’re deficient in it, which is unlikely unless you’re elderly or don’t eat meat. And even then, it’s questionable if acetyl-L-carnitine would make a difference. Another potential reason to include acetyl-L-carnitine in a fat burner is to help reduce mental fatigue while dieting, but the brain-boosting effects aren’t well researched in young people. Therefore, it may or may not be able to accomplish this for the vast majority of us who would use it for that purpose. Since acetyl-L-carnitine hasn’t been proven to burn fat, there’s no clinically effective dosage. For cognitive benefits in the elderly, the clinically effective dosage is two grams per day. Therefore, the 500 mg of acetyl-L-carnitine in a serving of LeanMode won’t help you lose fat and isn’t enough to enhance cognition or reduce mental fatigue. Green coffee bean extract is an substance derived from green coffee beans, which contain high amounts of the compound chlorogenic acid. Chlorogenic acid is a chemical that can reduce blood sugar and reduce the body’s ability to absorb glucose, which explains why research shows that green coffee bean extract can improve markers of blood vessel function and at least temporarily lower blood pressure in people with prehypertension (high-ish blood pressure). Since green coffee bean extract hasn’t been proven to reliably cause fat loss, there is no clinically effective dosage. The chlorogenic acid content of the green coffee bean extract in LeanMode isn’t listed, so you don’t know exactly how much you’re getting. That said, the best green coffee bean extracts on the market are no more than 50% chlorogenic acid, so based on the 500 mg of green coffee bean extract in a serving of LeanMode, the most chlorogenic acid it can provide is 250 mg. Therefore, the 500 mg of green coffee bean extract in a serving of LeanMode may be enough to temporarily lower your blood pressure, but won’t help you lose fat faster. Garcinia cambogia is a small fruit that has become one of the most popular fat loss supplements on the market. Garcinia cambogia contains the compound hydroxycitric acid (HCA), which blocks the enzyme ATP citrate lysase, which helps convert carbohydrate into body fat. Therefore, garcinia could theoretically reduce fat gain, and animal studies back this theory up. For example, HCA has been shown to reliably reduce food intake and inhibit fat creation in mice. Unfortunately, things didn’t pan out in human research, which has shown that Garcinia cambogia is more or less worthless for fat loss. That said, there’s one study that garcinia peddlers love because it found overweight women who took it for 12 weeks lost about three pounds more than women that took a placebo. The results were so small and inconsistent, however, that it’s impossible to say that the supplement was responsible for the effects. Since Garcinia cambogia hasn’t been shown to increase fat loss, there’s no clinically effective dosage. In the study cited just above, the women took 2.4 grams per day. Therefore, the 500 mg of Garcinia cambogia in a serving of LeanMode won’t speed up fat loss. Green tea leaf extract is the supplemental form of the leaves of the Camellia sinensis plant. Many of the health benefits associated with green tea come from polyphenols found in the leaves, which are molecules that protect plants against radiation and various disease-causing microorganisms. There are many types of polyphenols, and the green tea plant is particularly rich in the catechin variety, and in the most potent one in particular, epigallocatechin-3 gallate (EGCG). EGCG alone, it turns out, is responsible for most of the health benefits of tea, and that’s why research shows that green tea extract can accelerate fat loss, reduce inflammation, increase antioxidant capacity, reduce blood sugar, and may have anticancer properties. Let’s zoom in on its fat loss properties. Studies show that EGCG blocks the enzyme catechol-O-methyltransferase, which degrades the neurotransmitters adrenaline and noradrenaline. These neurotransmitters release fatty acids from fat cells for burning and increase metabolic rate, so by preventing them from being destroyed, EGCG can speed up fat loss. The clinically effective dosage of green tea extract is based on its EGCG content, and clinically effect dosages of EGCG range from 50 to 1,000 mg per day, but 400 mg seems to be the lowest dose that reliably improves fat loss. The 250 mg of green tea extract in LeanMode is listed as being at least 60% EGCG, which means it contains at least 150 mg of EGCG per serving. Therefore, the amount of green tea leaf extract in a serving of LeanMode may offer some health benefits, but isn’t enough to significantly impact fat loss. Clinically effective dosages of synephrine range from 25 to 50 mg per day, and a serving of Phoenix contains 834 mg of Advantra Z with 6% synephrine, providing 50 mg of synephrine. As you know, epigallocatechin-3 gallate (EGCG) is a catechin found mostly in green tea that blocks the enzyme catechol-O-methyltransferase, which degrades adrenaline and noradrenaline. Forskolin influences this relationship by activating the enzyme adenylyl cyclase, which converts ATP to cAMP. This initiates ATP-producing processes in the body, resulting in energy expenditure and fat bruning. This, in theory, should accelerate fat loss, and that’s exactly what has been seen in human research. As far as fat burners go, you can do worse than LeanMode. It doesn’t contain any stimulants or proprietary blends, so it won’t give you jitters or mess with your sleep and you know what you’re getting for your money. LeanMode also contains one ingredient that’s been proven to accelerate fat loss (green tea leaf extract), but you should know that the dosage is too low to be effective. Unfortunately, LeanMode also contains four ingredients that either barely or don’t work (conjugated linoleic acid, acetyl-L-carnitine, green coffee bean extract, and Garcinia cambogia). What’s your take on Phoenix vs. LeanMode? Have anything else to share? Let me know in the comments below!